This chart highlights two very interesting developments. I'll begin with the 40 bps rise in 10-yr Treasury yields that has occurred over the past month. 10-yr yields are now about 33 bps higher than they were just prior to Bernanke's late-August unveiling of plans for QE2. What is interesting is that even though the FOMC has now confirmed it will be buying/monetizing up to $600 billion of Treasury bonds of up to 10 years' maturity over the next 8 months, the bond market has decided to stage a protest. That protest has sent 10-yr yields up by 33 bps, and 30-yr yields up by a whopping 80 bps in just a few months. So the big rise in 30-yr yields that I have been highlighting for the past few months was the first clue that the market was starting to get uncomfortable with the idea of QE2. Too much money printing would surely cause inflation to rise in the future, and rising inflation would surely (eventually) cause the Fed to raise overnight rates. So why buy bonds that were paying historically low yields with the expectation that the funds rate could be zero for a very long time? The rise in 30-yr yields is a good sign that the fabled "bond market vigilantes" are mobilizing once again. The bond market is not going to be sweet-talked into accepting historically low yields at a time when the Fed is talking about throwing money out of helicopters in order to push the rate of inflation higher. 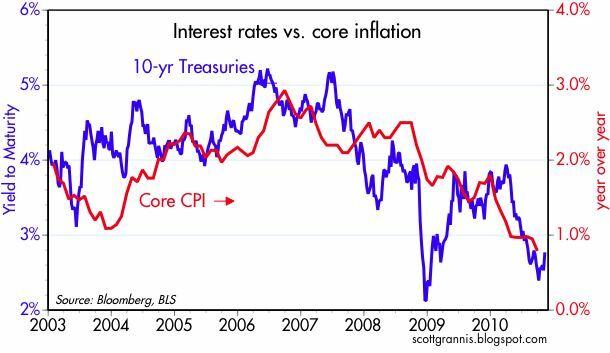 The next very interesting development shown in the chart above is the relatively tight correlation between bond yields and core inflation over the past several years. In an efficient market there should be a fairly close and predictable relationship between risk-free yields and the underlying rate of inflation in an economy. That's because investors and market participants have the ability to arbitrage between financial markets and physical markets. For example, if prices of most things are rising 10% a year, it wouldn't make sense to buy a risk-free bond that pays only 2% interest—much better to sell low-yielding bonds and buy real estate, gold, and/or commodities. Similarly, in an environment of nearly zero inflation, investors would not long ignore the opportunity cost of not owning risk-free bonds paying 10% interest—intense demand would drive bond yields down to a level more consistent with underlying inflation. Over long periods, it is generally the case that risk-free bond yields are largely determined by inflation. I say that the chart above is interesting not because it illustrates the well-known relationship between interest rates and inflation, but because it provides evidence that the main reason 10-yr Treasury yields have been so low is that inflation has been low. It's been surprising to me that inflation has remained so low, given that Fed policy has been ultra-accommodative for the past two years, the dollar has been historically weak, and gold and commodity prices have been soaring. In my defense I could argue, as some do, that inflation has been badly calculated and in reality is much higher than reported. But in my long experience with government statistics I have never uncovered evidence which undermines the credibility of U.S. government inflation calculations (the same can't be said of Argentina, however). So I prefer to think I have been the victim of Milton Friedman's assertion that "the lags between monetary policy and the economy are long and variable." Inflation has fallen more, and for longer, than I have been expecting. But that doesn't necessarily mean I'm wrong, or that interest rates and inflation won't be higher in the future. It could just mean that the lags have been unusually long this time, perhaps due to the nature of the recent recession. In any event, there is a valid monetary explanation for why inflation has been very low, and it goes back to the events of 2008. The financial crisis was such a shock to consumers and investors all over the world that the world's demand for dollars soared almost beyond comprehension. It took the Fed awhile to recognize this, and to counteract the huge shift in money demand with a correspondingly large shift in money supply. This introduced some serious deflationary pressure into the mix, and that showed up in TIPS breakeven inflation rates that were very low and even negative by the end of 2008. A deflationary shortage of dollars also showed up in a huge spike in the dollar's value towards the end of 2008, and a significant decline in the price of gold and commodities from mid-March through late 2008. The recent rise in 10- and 30-yr Treasury yields is likely telling us that inflation is finally set to rise. It wouldn't be surprising at all, given how accommodative monetary policy has been and promises to be. There is no shortage of evidence that money is in abundant supply: gold and commodity prices are soaring, the dollar is scraping the bottom of the barrel, and forward-looking inflation expectations built into TIPS prices have risen from 2% to almost 3% in the past several months. If inflation is indeed about to turn up, then no amount of QE2 can keep Treasury note and bond yields from rising. Actual and expected inflation can easily overpower even the most determined efforts of the Fed to keep long-term interest rates artificially low. The Fed is no match for the bond market vigilantes once they are aroused; the $9.1 trillion of Treasury debt outstanding is an order of magnitude larger than the Fed's proposed QE2 purchases. I sense that the stock market has been getting nervous of late over these same issues. Bond yields are rising, yet the Fed is already in the process of buying bonds. What's going on? Is the Fed on the wrong track? Is the Fed going to wimp out on its QE2 promises? Could deflation return? Could the economy suffer a setback? Lots of uncertainty, and uncertainty is never good for stock prices. It's often said that the market has a way of surprising the greatest number of people at the most unexpected of times. If that's to be the case once again, then we could be on the cusp of some very surprising developments. The current consensus is so firmly entrenched in the view that the economy is going to be struggling (i.e., the "new normal") for a long time and that inflation is absolutely dead, it would be a real shock if the economy and inflation were instead picking up. The shifting political winds in Washington are already blowing in a more positive "growth" direction, after all. I'm not afraid of rising Treasury yields, since they would be effectively signaling a healthier economy, the death of deflation fears, and the beginnings of some inflationary relief for underwater homeowners. Before too long, we would probably see the Fed put QE2 on hold, then decide to start raising the funds rate; that would cause all short-term rates to rise, and that in turn would be a very welcome relief to all those who are holding CDs and money market funds. Borrowing costs for individuals and businesses shouldn't have to rise by much, since credit spreads are still much wider than they tend to be during times of healthy economic growth. Rising Treasury yields would be painful for the Federal government, but a stronger economy and new efforts to control federal spending should cause a significant narrowing of the deficit over the next few years. I'm hoping the rise in inflation won't get out of hand, since that would bring a whole host of problems (e.g., a major Fed tightening followed by another recession). But lots of water has to pass under the bridge before we will need to worry about inflation getting too high. Scott, you may be surprised for a while longer yet. 3Q unit labor costs are down 1.8 percent, y-o-y. (DoL, 11/4). All commercial rents are down (retail, warehouse, office), sometimes way down. There is no business pricing power, demand is weak, and business operating costs are going down. That is not a recipe for inflation. You see the trend line on core inflation? What is about that trendline that says anything but deflation is close? Asian economies are rebounding, boosted by huge monetary stimulus (China went to double-digit money supply growth, and so did India) and possibly fiscal stimulus. China went hard and heavy into infrastructure). Yes, the USA is huge, but remember the Japan and China economies together are now as large as ours. And they buy far more commodities (much of our economy is mandarins in office buildings). No doubt global commodities have reflated back to "normal" levels of before the globo-recession. There is heavy, heavy speculation on the NYMEX. It will likely top out soon, and go back to a slow rise, as before. Sooner or later, commodities will become so profitable that a lot more capital will be drawn into the sector, as real investment in productive capacity, not speculation. But inflation in USA is right there with Jimmy Hoffa. The prospect of more QE does not effect 30 year T-bond yields through the mechanism of expected inflation over the duration of the bond so much as prospective volatility in long bond prices in the short run. The fed has really not been clear about what they intend to do and how they will respond to changes in economic conditions. The long bond has suddenly become riskier relative to T-bills. The fed has succeeded in spooking the markets. I am increasingly coming to believe that pure monetary policy - outside of a crisis - has little effect on the economy. We may have come to the point, thanks to globalization, technology and financial innovation, where the demand for narrow money is infinitely elastic and the financial sector can create all the "deposits" it needs irrespective of fed policy. This leaves the fed with a role to play in a crisis such as the 2007-9 period. In other words we seem to be operating on a dollar standard where money is created or destroyed irrespective of fed actions - much like physical production of gold was once irrelevant to the quantity of gold-based money in the short run. Any thoughts on the 1940s with inflation in the 5.5% range and interest rates (10-year) in the 2.5% range - with ample monetization? I never see anything about this, but remain perplexed. Mr. Grannis, thanks for the informative analysis. the dollar index on September 1 1992 was 78.33. Well, commodities fell 3 percent on Friday on the hint of lessening China demand. Where was the Fed? Not in the picture. "(much of our economy is mandarins in office buildings)"
Exactly. That's why GINI is going up and will continue to go up until the powerful supply-siders in both parties realize the importance of middle class demand and make tax policies accordingly. Jack Brown, re the 1940s: Things were quite distorted in the 1940s, between the war and price controls. But the cumulative rate of inflation was almost 70%. Printing money had its predictable consequence despite the price controls. 1. I think inflation will continue to trend slowly higher. 2. Interest rates on Treasury bills, notes and bonds should rise significantly over the course of the year, with 10-yr T-bond yields exceeding 4.5%. There are always reasons why someone will believe that a massive increase in high powered money will not result in inflation "this time around". But I suggest a quick perusal of the last few chapters of Milton Friedman's "Money Mischief" and you will most likely be disavowed of this thought in short order. The supply of money has been met with an increase in demand for dollars and a decrease in velocity. It's very unlikely that this will continue forever--the desire for "full employment" will continue to drive the foolish notion that monetary policy can somehow influence the level of economic activity in the long run. Not likely. The Fed can control the supply of money--buy anyone who thinks it can control interest rates has a not been keeping up with the history of money over the past few centuries. Steve: I'm glad you agree with me. "always and everywhere a monetary phenomenon". While someone can always find something somewhere that isn't going up in price--good lord have you seen the cost of 50 inch high def tvs (I'm waiting for the "buy a gallon of milk-get a free 50 inch tv" special)--but the history of money manipulation of this magnitude--especially given the desire for full employment---seems unlikely to be compatible with a 2% 10yr rate. Just discovered your blog and am excited to learn more. Thanks!